2/24/19 7:10 AM Gravel bike? In an effort to kickstart my lazy a$$, I registered for D2R2. I registered for the 160 which may be optimistic, but you can ride whatever you want. I’ve had my medical issues, but at this point they seem manageable and I think more an excuse/mental barrier than physical. 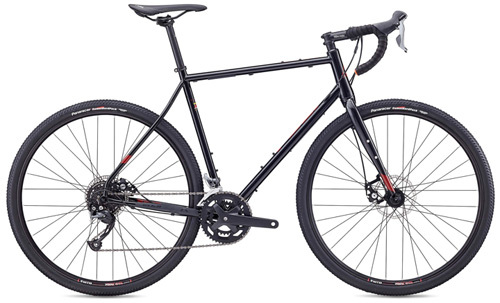 So I’ve always ridden it on my Crosshairs cross bike with cobbled drivetrain with low gears, and in fact have laughed at the concept of “gravel bikes,” but I’m thinking at this point there might be something to be said for disc brakes, a bit larger tires and a less creaky/cobbled drivetrain (particularly on this course). I saw Nick’s fine machine, though I probably don’t need anything that high end. My shop is a Trek dealer, the Checkpoint looks OK? I’m going to want a less than 1:1 low. It’s probably too late to order a Sachs cross bike :). Plus last I heard he wouldn’t use discs. Of course I may chicken out on all of this, but in the meantime all ideas welcome! I would suggest that you only consider bikes with flat mount dusc brake mounts. I dunno if thats what the Trek has or not. Campy only makes flat mount disc brakes. All 3 component makes have flat mount but Shimano and Sram also have post mount, I think. Where I'm going with this is I have a cutom ti gravel bike that does not have flat mounts for disc brakes. That was not on the horizon 3 1/2 years ago. Anyway, I can't use Campy hydraulic disc brakes on it. Frown. Are you close to Woolrich. ME? Bikeman/Carver are there Thats what my frame is. Its great. They have ti frames from Lynskey and also Asia, but I/m not sure if they are flat mount. My frame has been great, but I am considering one that has flat mount when campy 12 trickles down to Chorus and the cassette options increase. 2/24/19 9:46 AM Am I close to Woolrich Maine? Carver bikes? Well that would be Woolwich, and I’m close enough that Paula Carver once beat me in a time trial. That is an exemplary shop and company, and I have no doubt their bikes are excellent. I might take a look. I don’t know the complexities of discs, but I believe the Treks are flat mount. I’m finding a SRAM 1x12 would give me a 38-42, perfecto. I suggest you start with what the max tire size fit for what ever bike has and go from there. The choice to fit a 47mm 650b could be something you'd want. And there are a zillion choices. I picked up a 650b Stans Arch/mk3 wheel set at Performance before the doors closed for 1/3 price. Just got some Tubeless Teravail Cannonball tan wall 47x650b mounted up on them but not ridden yet. Rims are 29mm wide, and tires sit out nice. Same height/diameter as my 28mm road tires, probably be taller on a narrower rim. Wheels do QR of ThruAxle came with all the adapters. FWIW, I'd use the inexpensive Redline Conquest Disc I put together last year with 40mm tubeless in a NY minute for such an event. Agree flat mounts, unless you are talking something like my Conquest that had post mounts and was NIB and perfect fit. Another consideration is wheels. The Conquest is QR and all my 27.5 and 29er and Strong Disc wheels interchange. A less expensive Thru Ale gravel offering is likely to have boat anchor wheels. ...as they are so superior for gravel/off-road use that it's not worth toying with the idea of rim brakes. After suffering with both cantis and mini-vs, I would never go back to either one. As for flat mount vs. post mount, unless you plan to use Campy, it probably doesn't matter much. Flat mount is certainly the trend for road and gravel bikes, but I'm not too thrilled with the lack of adjustability and difficulty dialing them in on some frames. In that regard, flat mount is actually a step backward. If you're going to buy a new bike or frame, you may as well get flat mount. If you're considering a used or prior year new bike, I would go either way. Since you're fond of SRAM, you won't have any problem finding compatible levers and calipers for either type. As for the type of bike, both of mine and both of Linda's have been 'cross bikes modified with lower gearing and wider rubber. Particularly if your main riding will be dirt roads, I think they're the way to go for someone who's used to the handling of road race bikes. Used 'cross bikes seem to be easy to find, if you want to keep your investment down. OTOH, if you plan to do some bikepacking or gravel bike touring, a gravel-specific rig might be a better choice. If you want 650b wheels, a gravel-specific bike is your only option. FWIW, I still don't buy into the 1x craze for gravel. Again, it's mainly due to coming from a road background where I've developed a preference for close-spaced gearing. The idea of running a 10-42 cassette is not even remotely appealing to me, but that's just my personal bias. I'm currently running a 46/30 crank with a 12-32 cassette and I love it. If you feel you need more top end, 11-32 cassettes are readily available. I have a second set of wheels with 30mm slicks and a 12-25 cassette for road use. When we travel, these are the bikes we bring, as they work great for any type of riding we may want to do, with just a tire or wheel swap. "FWIW, I still don't buy into the 1x craze for gravel. Again, it's mainly due to coming from a road background where I've developed a preference for close-spaced gearing. The idea of running a 10-42 cassette is not even remotely appealing to me, but that's just my personal bias. I'm currently running a 46/30 crank with a 12-32 cassette and I love it"
I think Brian has this correct. 1X for mt. bikes makes a certain amount of sense especially when you are constantly ascending and descending with the terrain dictating the timing of the front shift. Sometimes you just struggle to get to the granny, then find yourself back in the big, etc, etc.... 1X gives you your range of the 2X system. Lots of mt. bikers I talk to love 1X and I just ordered a Specialized HT with a Shimano 1X. One thing I noticed on a number of the Trek Checkpoints is they use 50/34 and 11-32 or 34 cassettes. Is that low enough for D2R2 ?. 1X and especially the SRAM 12 system has HUGE jumps between gears, 36-42 than 50 on the 10-50 cassette. I question if you would find yourself between gears on some of the long climbs. I have ridden D2R2 4x with exactly the gearing Brian has (except a 10 speed cassette) so I know that works. OTOH, on that ride you shift the front approximately a million times, going up and down short, steep hills all day. I don’t have any particular problems with a front derailleur, OTOH I don’t require really close spaced gears, so I’d have to look more closely to see if the simplicity of a 1x system would be worth it in my case. I’d never use a 50, maybe a 42. OTOH no prob with a front der if that makes more sense. If I got a Checkpoint I’d get a frame and pick the components, no problem with the shop I have. I will definitely have a low <1:1. A note that on a lot of newer mt. bikes that come as 1X, they have no provisions to install a F derailer after the fact. I'd look at that design for a frame in the event you want to someday go back to 2X (Di2 ?). Post VS flats and thru VS QR, depends on the peice point. Where are opinions on cable VS hydo in the scheme of non high end bikes for the purpose? Like 29ers, 28-30lbers are quite an unattractive prosition imo. With me on D2R2, I’m not sure spacing matters much. Uphill I’m in the low gear all day, downhill I’m trying to slow the bike down so I don’t kill myself, flats I’m trying to recover. So I’m never really trying to go fast, just survive. And that would be the case now more so than before. So a couple moderately high gears would probably be fine, even pretty widely spaced. But I’d have to ride a 1x to know, but maybe I can do that at the LBS. Steve I can guarantee you I’ll never use Di2...:). I don’t use Shimano and I have e-tap on a road bike and it’s fine but I don’t think it’s any significant advantage over a good mechanical system. If you want a Strong Steel All Road/Gravel, better order before 4/1. After reviewing our 2018 financials it has become clear that our inputs for steel frames have slowly increased over the years. Without even noticing it they have risen to the point that it is now just as expensive to produce a steel frame as it is a titanium frame. The result being that we are raising our base price on steel frames to $3200 starting April 1st 2019. All deposits taken prior to that will receive our current pricing of $2200. Fuji Jari 2.5, Claris Gravel Reynolds 520 chromoly, rack & fender mounts, Triple bottle mount, Flat mount disc, Panaracer Gravelking SK, 700 x 38c. I also use a 30-46 crank, but a 12-27 9speed cassette. If I go 12 speed Campy, I'll probably get a 12-29 when and if they offer it. I also am not attracted to the 1X on a road/gravel bike. I think I'd like it on a mtb though. Rotor calls the 10-46 their close ratio cassette? I compared the standard SRAM 1x11 (38, 10-42) to what I've used at D2R2 (46/30, 12-32 10 speed) and it ain't that different. I have about the same high with the 1x11, and a slightly lower low, which would be welcome. The gaps for the lowest gears are about the same. The gaps for the higher gears are bigger, and I think would be OK for me as I've noted I don't care much about going fast on that ride. The shifting simplicity is not essential but I would like that. I like the sequential shifting on my Rohloff. So I don't know that I'll get it, but I think it would work pretty well for me. YMMV. ...you may want to consider it for your gravel rig in light of the fact that it's on sale now that SRAM is making 12-speed. Universal Cycles has it at ~1/2 price. There's one thing you may want to consider before you make your gearing choice. I presume you'll be using your gravel bike for more than D2R2, so tailoring the gearing to that single event could compromise your enjoyment on other rides. The crank choice is the single biggest factor, since it's easy and relatively cheap to swap cassettes. If you commit to 1x, you have to accept the limitations across all the riding you do with it. I tried it a few years back and found that I couldn't live with it. "It’s probably too late to order a Sachs cross bike :)"
The smiley is because he is not taking any order anymore, yes? I don’t see Strong selling many steel bikes at $3200 but what do I know. I’d go ti at that price. Lots of nice options in that price range. Steel frames @ 3200.00, add fork. Did not see price fork custom fork in his price list. Just aftermarket. I really like the steel matching fork on the Steel disc allroad/gravel frameset he made me in 2015. Hi Bob, no, titanium is not going up. Basically this is the deal; steel pricing had always been less as a matter of tradition. I'd never really though twice about it. But on further analysis it became obvious that steel offers no time savings over titanium. At lease half the time for any order is customer interaction. There may be some time saving in fabrication but it's eaten up by boxing, shipping and unboxing the frames that go to paint. There is also more risk with a painted frame in both terms of damage and warranty. Add to that the increasing cost and reduced availability of quality steel material and increasing cost of paint and shipping to paint and back. Suddenly you see that steel should be every bit as expensive as titanium. I stopped by the LBS to pick up some tubes and stuff, and looked briefly at a Checkpoint SL5. They said I could swap out the 105 double for a SRAM 1x11 drivetrain and that would be cheaper than building up a frame from scratch. For use including D2R2 they recommended the 5 carbon and opposed to the more expensive 6, as they said the 5 would be better with rocks bouncing off it. I think a 38 ring with an 11-42 11 speed cassette would work pretty well for me (I know others would not like the gaps). I’m not about to pull the trigger, but it makes sense to me. Compared to my cross bike, this would give me discs, wider tires, another low gear and a presumably less glitchy drive train. Took a good dirt road ride on the old Crosshairs today, fun! Though there was a good bit of damage to the road from the winter, which they remediated by dumping mass quantities of loose stones into the holes and gaps, which gave my a little pause on the descents....got through them with the rubber side down though. Great to get out, road yesterday dirt today. Legs feel pretty good! After 30 years of using mt. bikes with 3X cranks, my new HT came with a 1X Shimano shifter/derailer and Sunrace 11 spd. 11-46 cassette and I can state after 2 weeks of riding as often as I could I now understand why 1X took off. No thought process as to when to go to the granny, or back up to middle, it’s just click-click-click and the gearing is there. For stuff like D2R2 I think it’s going to be perfect. As a flat’ish gravel road or dirt rail trail bike, maybe the gearing gaps would be annoying.